Self-adhesive and over-laminated pipe identification tapes for External use. This section includes 50mm, 100mm and 150mm wide coloured tapes and directional arrow tapes. New - we can now supply 275mm wide tapes for external use - please contact us for details. All rolls of External Tape are 23m long, except the 275mm wide tapes which are 33m long. Internal and External Pipeline ID tapes are also made to order. There are sections here to Create Your Own External or Internal Tape online, alternatively you can send us an email or give us a call with your requirements and we would be happy to provide a quotation. All tapes can be printed to RAL or British Standard colours. 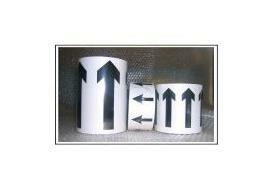 Self-adhesive and over laminated pipe identification tapes with black directional arrows for external use. All tapes are 23 meters long with black arrows on a white background in 50mm 100mm and 150mm widths. Self-adhesive and over laminated coloured pipe identification tapes for external use. 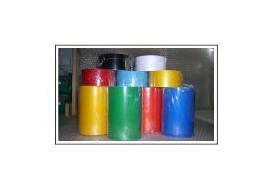 All tapes are 23 meters long and are 50mm, 100mm or 150mm wide. 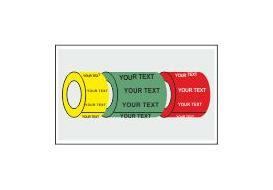 Create Your Own self-adhesive and over laminated coloured pipe identification tapes with or without descriptive text for external use. Available in 50mm, 100mm or 150mm widths. All external tapes are 23m long. Choose your own background colour and black or white text can be added. All tapes can be printed to Pantone, RAL or British Standard colours, with tapes printed to a British Standard colour conforming to the latest BS1710:2014 and BS4800:2011 standard. For tapes printed with additional colours, logos, etc or for tapes in a different width, please contact us for details.